The First Quarter 1965 edition of Modern Steel Construction has marvelous article on the construction of Atlanta Stadium. The multipurpose venue served as arguably the most successful “on spec” stadium ever built. That’s to say that the stadium was built specifically to attract teams to Atlanta, which had no major pro sports franchises to call the city home. Initially, Charlie Finley wanted to move the A’s to Atlanta from Kansas City, but the American League blocked the move. The NFL was slow to approve a franchise move or expansion to Atlanta, until AFL-related parties showed interest. When the stadium broke ground in 1964, league interest was piqued and deals started getting done. First it was the Braves moving from Milwaukee, followed by the NFL expansion Falcons franchise. Both teams had a spacious, modern venue to share. The layout was akin to the Coliseum, with the lower deck seats conforming to the bowl shape. This yielded large foul territory and a lengthy distance from a 50-yard line seat to the sideline. The biggest differences between Atlanta-Fulton County Stadium and the Oakland-Alameda County Coliseum were that the former was enclosed and built with more structural steel as opposed to the all-concrete Coli. When Atlanta was awarded the 1996 Summer Olympics, local officials saw a way to reuse the showcase Centennial Olympic Stadium for baseball. To do so, the main grandstand would be built with a baseball-friendly contour. Temporary sections would be built for the Olympics, creating a capacity of 85,000. Those stands would be torn down after the games, allowing the Braves to fill in the rest of the ballpark in left and center field. Eventually the venue re-opened in 1997 as Turner Field (named after the team’s then-owner, CNN magnate Ted Turner). An outline of the temporary stands forms the large entry plaza in left field, while a wall and the outline of the baseball field commemorate the old stadium in the parking lot across the street. After the Braves moved in for good for the 1997 season, the newly rechristened Turner Field looked like a ballpark in form and function. It had large, wide concourses. A large outfield complemented the Braves’ pitching staff, and the rounded fence was reminiscent of the old Launch Pad. Foul territory was significantly reduced. Yet one couldn’t help but feel that the stadium was cavernous. The split lower deck has a total of 46 rows, a reminder of how many seats had to be crammed in there for the Olympics. No other lower deck has nearly as many rows, including the split lower deck setups in Anaheim, Arlington, and Baltimore. The main concourse at row 30 is dark and somewhat cramped. The next concourse on row 46, airy and huge. The club level cantilever is modest, covering most of the upper section of the lower deck. A ramp in right field extends so far out it feels like it’s in another ZIP code. Including the outfield plaza, the whole site takes up 20 acres. Even the ballpark footprint alone is about 17 acres. Fulton County Stadium’s circular footprint was a meager 10 acres. What remains is a vast, family-friendly ballpark well suited for the modern fan. The outfield has numerous play areas and attractions, restaurants with fare at many different price levels, and space, space, space. Turner Field was among the first ballparks to implement a large center field scoreboard plaza, and this one makes AT&T Park’s rendition look like an apartment balcony. Along the left field upper deck sits yet another play area called the Coca-Cola Sky Field, a synergy of adapted re-use and branding that would only be possible in Atlanta. The park lacks a signature element to distinguish it from others. There’s no contrived affectation in the outfield. The scoreboard was once the largest, but has been surpassed by others since. The skyline of Downtown Atlanta is somewhat obscured by the Delta Sky 360 Club above the left field seats. Dark blue is the predominant color, though there’s plenty of muted green throughout in the columns, trusses, and railings. And the facade has some brick to cover the concrete, only enough to make it look like someone stopped work about a third of the way through the job. Turner Field’s real gem is the Braves Museum Hall of Fame. Entrances are along the left field concourse and the outfield plaza, the latter for use on non-game days. Admission is $2 (via a token) during games, $5 at other times, and can be packaged with a $17 stadium tour (which I did not have time to take). The museum is chock full of exhibits celebrating the franchise’s different eras in Atlanta, Milwaukee, and Boston. A statistical leaderboard displays all of the accomplishments of Braves greats, and there are lockers to honor players and notable teams over the years. 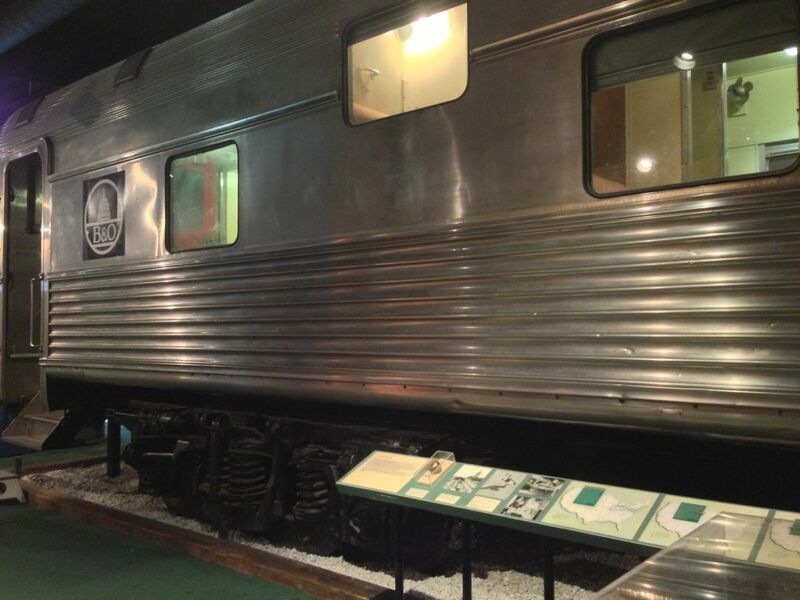 There’s even a Pullman rail car that fans can enter to experience what it was like to travel from city to city by train. Of course, there’s a great homage to Hank Aaron, plus preserved dugouts and seats from the old Stadium. Best of all, when I checked in via MLB’s At the Ballpark app, I received a coupon for free admission. If you get to the game early and have time, it’s definitely worth the hour visiting the Museum can easily take up. The only public transit directly serving the ballpark is local bus. The Georgia State MARTA station is the closest at 1 mile away. A better choice is to take the free ballpark shuttle for MARTA riders, which originates at the ever sad Underground Atlanta mall adjacent to the Five Points station. It’s basically set up for fans to walk through the mall and perhaps pick up something before boarding the shuttle to the ballpark. The ride takes 10 minutes and the return trip drops fans off directly in front of the station. My trip was such that I flew into ATL in the morning, took the Red (or Yellow) line to Five Points, then the shuttle to the park. Cost was $2.50 each way, plus $1 for the Clipper-like Breeze card used for area transit. Simple enough. Turner Field improved on Atlanta-Fulton County Stadium in many of the same ways other cookie-cutter-cursed cities had their ballpark experiences enhanced. While Turner isn’t as intimate as PNC or as distinctive as AT&T or Camden Yards, it’s comfortable and has good sight lines and food. More importantly, it stands as an innovative example of stadium re-use and financing, since the whole thing was paid for with Olympic sponsorship dollars. That’s not a point the casual fan will care about. For a stadium geek like me it’s a bonus point. By those measures Turner Field is a major success, and finally a permanent baseball-only home for a once-nomadic franchise. While I like circular designs in general in architectural if not practical terms (in other words, they look cool but put you further from the action), the marriage of the asymmetrical grandstand and circular outfield has always seemed like a weird mishmash to me. Having sharp angles in foul territory and a circle in fair territory is kind of the reverse of the Coliseum. Unfortunately I couldn’t convince the wife to go to the first half of a game last season (2012, with Tim Hudson pitching no less) during a long layover at the airport there. I didn’t realize that the lower deck was so big-that’s a bad fact. You could tell that Atlanta-Fulton County Stadium and Cincinnati’s Riverfront Stadium were designed by the same firm, similar exteriors and roofs. I miss stadiums that had multi-colored seating. I got to take in a game at Turner last year and I have to admit it left me very underwhelmed. It was a good scheme to get a ballpark built with a minimum of fuss, but the resultant park just feels too big and too cheaply built. You really can’t understate how cavernous it feels. The concourses, particularly the row 46 one are largely barren and devoid of not only character but even concessions. The lower concourse and left field concourse are dark, dank and dreary with no field view or natural light. The upper deck was very far removed from the field. And as for the scoreboards it was the complete opposite of the Coliseum. One is likely to have an epileptic seizure from all the flashing ribbon and half height boards littered around the park. To me it felt less like its 90’s-today brethren and more like an updated Coliseum. To put another way, Turner feels older than Anaheim to me. Honestly, Turner Field is probably neck and neck with CitiField for class of the NL East. Went there a long time ago (99′ WS), I might not remember it that well, but it is one of my favorites from those parks built in the 90’s. I liked the outfield main entrance with the giant Braves store. I remember eating in a restaurant in right field with great sights of the field. It is also interesting to see the pillars and original outline of the demo’d olympic stands, think it gives it sime historical significance. Jeff, more so than Citizens Bank Park? Personally like the clean, spacious looking 200-level concourse and that Outfield Plaza. Turner Field; an overall good looking Yard IMHO. Citizens Bank Park is my least favorite in that division. It’s out in the middle of nowhere and feels like the new cookie cutter, to me. I think of newer stadiums I have visited the three most disappointing were CBP, Yankee and Arlington. I haven’t been to Turner field, but I understand those that have, really seem not to like it much. I guess if 95% of the baseball games you have attended in life took place at the Oakland Coliseum (like me), especially in the last 15-18 years, then Turner looks pretty darn good. Jeff, if location is your big knock against Citizans Bank park I don’t get how you give Turner Field or Citi Field a pass. Neither is in all that compelling of a location either being surrounded by parking lots and in Turners case residential neighborhoods. In fact no stadium in the NL east is in an all that great of a location when compared to say the NL West. I expected Turner Field to be somewhat polarizing, maybe not this much. Good discussion. It’s not a great newer ballpark, it’s not a bad one either. Mediocre architecture with bonus points for reuse and museum. Guess it really depends on what you’re looking for in a ballpark. The museum is top notch and there’s no doubt who plays there when you’re walking around Turner. To the Braves credit they’ve done a lot with what’s there. That said it does leave much to be desired. Though not so much that I’d say its the dog of the NL east either. That ‘honor’ goes to character-less Nationals Park or that iPod/spaceship in south Florida. I think that rating the nl east stadiums is an exercise in nitpicking. I love nitpicking! But, really, they don’t have a really awesome joint in the lot. I liked Turner and Citi because they both felt like the “neighborhood.” The rotunda at Citi feels like a rail hub. The Ted feels kind of gritty, short of grungy chic for sure. But I think we can agree, Nationals Park feels like it could be in any city. It’s so unremarkable. Citizen’s Bank felt very Disneyish to me. Like it was the “Main Street USA” of ballparks. Comfortable, yet fraudulent. Miami felt like Jabba’s sail barge or something out of BSG. Not much like a ballpark more than a hollow exhibit at a galactic flea market museum. Guess we can agree on that. The NL east has probably the sorriest collection of parks overall. The NL west on the other hand IMO has one of the best collection of parks overall. PETCO, Coors and AT&T (as much as it pains me to say it) are all top notch parks. Dodger IMO is the class of the 60’s parks and still an amazing example of what could have been if not for the multipurpose craze. And Chase Field while not spectacular was a trailblazer for modern real grass retractable domes and is just what was needed for the desert. looks a bit like us cell in chicago. maybe because there’s no distinguishing feature that so many of the other newer parks have. also both parks don’t have any of those nookes and crannies these other parks have in terms of the outfield walls as they’re both symmetrical. you basically cut the park in half from homeplate to cf and each half would match the other side pretty much. I like CB, I went there for two games, it was a huge improvement on the Vet which I hated but I only paid $5 for tickets too. I can’t knock it for being on South Broad, there were discussions about putting closer to Center City but its hard to find a place there. I didn’t realize Turner was a result of the games, that was smart of the Braves to go this mode and same themselves some cost by piggybacking on the games. As for Citi, its not much different than CB but a bit stale and worse concessions. In my view, its more off the beaten path, there is nothing in Willets Point except the park, Arthur Ashe and the park. At least CB has some stuff, I hear they have a Xfinity Live which I haven’t checked yet. RIP Spectrum, I saw David Lee Roth there along with Fuel and the Hooters. Slightly off topic, but I’m noticing a theme here brought to light by comments re Turner Field: not all succesfull yards are located in downtowns, the urban core. Turner Field, Citi Field, Yankees Stadium, Citizens Bank Park, Miller Park, Ballpark at Arlington, Angels Stadium…you get my drift. I know a lot of us would like for a new A’s ballpark to be in either downtown San Jose or Oakland, as opposed to “out in the middle of nowhere.” But if either can’t happen for obvious reasons, why not a ballpark in Southern Alameda County; especially near BART? A spanking new yard for our A’s just west of Warm Springs BART/Fremont would work just fine for me (and I’d imagine for thousands of other A’s fans as well). NIMBY, site acquisition issues aside, a ballpark in Southern Alameda County could work out just fine for our A’s. Yes, a downtown ballpark would probably be ideal (I’m with yah on that! ), but as Turner Field and other ballparks have proven, it’s not a necessity. BTW, as a Raiders fan, looks like I’ll be attending a game at Levi’s Stadium after all…GO QUAKES!! None of these are considered the class of the new ones. However, in looking at the contrary to the popular idea, none of the stadiums built in the boom between 1909 and 1915 are “downtown” (see early 20th stadium comparison). Rather, they were all in neighborhoods with streetcar access. 11 out of the 14 were at least 2 miles away. So I guess the point is that a downtown stadium was not required way back when, but is now if it’s to be one of the elite ones. One thing that I have noticed in my favorite ballparks is that they have been integrated into a neighborhood. Camden Yards feels like ti’s been there forever, as an example. It’s hard to do that out in the middle of nowhere. The A’s have that opportunity in San Jose, at Diridon. The Coliseum site, not really. Agree with you 100%! My take is a big WHAT IF? What if downtown San Jose can’t happen for reasons beyond the A’s control? And what if a downtown Oakland ballpark can’t happen either (probably a complete given that its not happening)? If the A’s are left to build in Southern Alameda County we can still get a quality yard to call our own. Yes, won’t be “elite” or ideal, but it could definitely work. Turner Field and the other “out in the middle of nowhere” parks prove it. Southern Alameda County is done. There’s no place to build and too many obstacles. The Warm Springs folks have made it clear they will never accept a ballpark there, no matter how much sense it would make to put it right near the new BART station. If San Jose can’t happen, we’re probably looking at Portland, maybe San Antonio. Whatever you say pjk…Happy Halloween! If San Jose can’t happen, I’ll hoping beyond hope that it will be Sacramento rather than Portland or San Antonio. If it can be Portland or San Antonio, than there is no reason it couldn’t be Sacramento, wait just in the SF Giants say everything north of Napa County to the Washington state line, belongs to them. I guess its San Antonio, oh well. I think Sac-town would work fine … simple renovation of Railey Field and it’s done. Except a renovation of Raley Field isn’t simple at all. In fact you’d have to rebuild the entire stadium. Which means Sac would need to find 500 million in a town that can barely stomach the cost of the Kings arena… Good luck. I’ve been to Turner Field several times. I liked it and always thought it was a bit under rated. Definitely agree with others about the Museum/HOF…thats certainly something I hop gets incorporated in a new A’s ballpark. I love the way the Atlanta Stadium infield is recreated in brick in the parking lot and that the “715” sign hands on the wall there. ML: While in Atlanta I hope you got to have a meal at Mary-Mac’s Tea Room. …and the Braves announced this morning that they intend to move north, to Cobb County.